And so nothing will change once again. LABOUR – get away with it. Labour lose around 50,000 votes and drop from 42% of the vote to 35% of the vote and yet still have a workable minority government position. On the basis of a 45% turnout, that means we all have to suffer another 5 years of Welsh Labour’s Blairite red tory complacency on the back of just 19%, less than one in five, of the electorate voting for them. If that doesn’t highlight just how far away we are from any form of truly proportional representation we are still, I don’t know what would. It seems that they were saved by the fact that the FPTP constituency element saw them lose votes everywhere, yet with big majorities for the most part, they were still safe as houses with just a few exceptions. Of course, losing Leighton Andrews so spectacularly was a big blow. His Assembly career has been a bit chequered. His surplus places policies and school banding crap tarnished his time in charge of education – contributing nothing but anxiety and doing nothing to address Wales dismal performance in PISA comparisons. He oversaw an alarming decline in performance in all core subject areas.And yet this appalling legacy probably didn’t do for him as much as his pathetic “cheap date” quip against Plaid Cymru in the last session of the Senedd before it was dissolved for this election. Boy, did Leanne Woods capitalise on that in her constituency (even if the reaction in the Senedd, blocking the Health Bill, was poorly judged). His belligerency may be missed by some, but as a potential leadership challenger, I doubt if even Carwyn will be too gutted he is history. PLAID CYMRU – the bare minimum necessary progress made. Leanne Wood’s trouncing of Leighton Andrews was a ringing personal endorsement of Leanne on her home patch. Leighton Andrew’s contribution to his own downfall aside, it showed how Leanne is capable of connecting with people and persuading people when they get to know her. That her good TV debate performances were not enough to spread the ‘Leanne effect’ far and wide (a la Nicola Sturgeon in Scotland) tells me that this is not the format she should be relying on. This map is hugely telling. 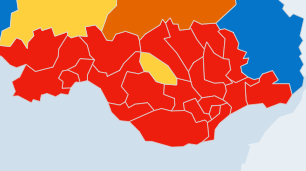 That blob of yellow surrounded by red is Leanne’s Rhondda seat right in the very heart of Labour’s South Wales heartland. It should be seen as the first domino to fall. For Plaid Cymru to ever sweep to government (like the SNP in Scotland) they have to connect with Labour voters. Some of the neighbouring seats saw decent PC progress (Pontypridd and Aberavon, both +5% and second place; +9% in Merthyr Tydfil & Rhymney and a spectacular +31% and a very close second in Blaenau Gwent.) Add to this a whole raft of other second places, some much closer than others, and there are plenty of places for Leanne to spend increasing amounts of time, not too far from home, where she needs to sprinkle her magic dust. They also still have issues with their messaging. It was clear from a whole raft of messaging boards and from comments made in response to things like the political compass indicating that Plaid Cymru should be their party, that the language issue remains a barrier. I know that this is controversial, but it is also incontrovertible. Just a glance through the names off their candidates highlights their their over-riding Welshness . Leanne Wood is the least welsh name among them! So another priority for them has to be in addressing greater diversity in their candidates (even their only openly gay AM is called Price!) and finding ways to ensure that the vast majority of Labour voters, especially those of relatively low educational attainment, feel perfectly comfortable voting Plaid Cymru despite having no welsh and/or no desire to learn or embrace the language. That this is a message that will be resented and resisted by many members will simply prove my point. Overall then, very disappointing, but with enough encouragement to foster the belief that major advances are tantalisingly close still. They need to resist any deals with Labour, continue to press the ecosocialist agenda that is way forward for developing a Welsh economy and Welsh society that succeed and stand strong in the face of neoliberal assaults from Westminster, Brussels and, indeed, Cardiff Bay while Carwyn and his Red Tory crew remain in charge. CONSERVATIVES – On the one hand it always good to see Tories take a kicking, but that they lose 3 seats to the ultra-Tories of UKIP is not really any good to anybody. However, it was still good to see them drop below Plaid Cymru’s contingent into third place overall. It means that we Leanne does at least become the leader of the opposition in every sense. UKIP – I’ve little more to say than WTF!!!! It just goes to show how you can fool some of the people much of the time. The worst thing about their ‘success’ is that with their awful track record of attendance at any institution they get elected to, partly because they have no friends and nobody is interested in listening to them anyway, it hands Labour a working majority to all intents and purposes. Hamilton and Reckless will quickly get bored and I’ll be surprised if any other than those living locally are seen much at all. It will be interesting to see how all those egos get on together. Gill better keep watching his back methinks. LIB DEMS – Woeful. Sad. Good people lost. The end. GREENS – I told you so. If you are ready to listen, you know where to find me. Stick the fivers you owe me in the party kitty – it must be desperately bare by now. And so it goes on. The Senedd should become a bit more lively, with a few loud and brash characters added to the mix (try to calm down a bit now, Neil McAvoy) and nothing having an easy ride through, but the Welsh people have had their say. They haven’t changed enough and so they can’t expect any real change. Perhaps another 5 years of mediocrity will shake them from their stupor. This entry was posted in Uncategorized on May 7, 2016 by Bridgend's Green Leftie. To be fair, there are a lot of Welsh surnames in Wales and you can’t ban good people for having them. We could look for candidates called Farage or Hamilton and find policies that militate against keeping people with Welsh surnames in Wales. We could become less left wing but then we would be a mix of UKIP and The Labour party. Is that what we need? I suggest not. You are missing the point. I’m not talking about banning any one. The point I was trying to make – in a rather clumsy way it now seems – is that the Party has to broaden its appeal in as many ways as possible and that when this is achieved, we may see greater diversity in the people selected and elected. Plaid Cymru Neil McEvoy 10,205 31.9 % up +11.9% https://en.wikipedia.org/wiki/Cardiff_West_(Assembly_constituency) and then there’s Plaid, Rhun ap Iorwerth who got 13,788 votes (54%) with a majority of 9,510.’s .. .is .that a welsh enough name for you? Indeed – fantastic effort from Neil – almost more impressive than Leann’s result. It will be interesting to see how he adapts to being an AM. I love some of the things he does, but he can be unecessarily confrontational and aggressive at times. I wish him well though. The strong Welshness is a big bonus in the places where Plaid usually wins. Not a handicap. The candidates have similar names to the people who vote for them. That said, the party has always wanted more English sounding names too. They need to do that whilst keeping and indeed growing the support in the Welsh-speaking areas. Great results for Leanne and Neil but still a long distance to go nationally. That will make a difference to the party’s language perception, but can we keep the Rhuns and Llyrs as well please! Ideally, a sprinkle of not just Welsh and English names would help perceptions of inclusivity.